Pyotr Tchaikovsky was born in Kamsko-Votkinsk, on the 7th of May 1840, and was the second of six children. He began attending the St. Petersburg School of Jurisprudence in 1850. His first appointment was a clerk in the Ministry of Justice. 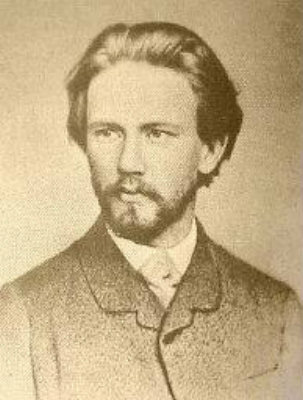 In 1863 Tchaikovsky left his job in the ministry to study music full time at the St Petersburg Conservatory. Anton Rubenstein, the director of the conservatory, encouraged him to study everything including conducting. However Tchaikovsky was terrified of facing an orchestra (even later in life). He said that he feared his head would fall from his shoulders, and always conducted with his left hand holding his chin - just in case. Graduating in 1866 he joined the staff of the Moscow Conservatory, where he was to remain for nearly twelve years. His first major compositions date from this period. His fame as a composer began to grow steadily and in 1877 he came under the patronage of Madame Nadezhda von Meck who gave him a yearly allowance permitting him to give up teaching and devote his time to composition. They never met each other at her request, but their correspondence was extensive and frank. He dedicated his fourth symphony to her. Also in 1877 he contracted his disastrous marriage with Antonina Milyokova, one of his pupils. The marriage is now often seen as an attempt by Tchaikovski to conceal from the world, and perhaps from himself, that he was homosexual in inclination. It only lasted for nine weeks and ended in a failed suicide attempt by the composer. They separated, but never divorced. Tchaikovsky continued to support Antonina financially until his death, after which she took on a series of lovers and finally died in an asylum in 1917. Tchaikovsky’s four orchestral suites are modelled on the baroque dance suites, being made up of a series of independent, contrasting, dance movements that flow together to form a complete unified work. The first suite, written in 1878-9, incorporates a fugue in the first movement as a further indicator the baroque origin. However, the style of the work is not baroque, but overtly romantic. The movements are reminiscent of the characteristic dances from the Nutcracker and Swan Lake, each being complete in itself, having a strong descriptive character and making brilliant and imaginative use of the orchestra. On the 6th November 1893, just nine days after the first performance of his Sixth Symphony, Tchaikovsky died. The manner of his death is uncertain, but it is generally agreed that it was suicide. One theory is that he contracted cholera by drinking infected water, a second is that he poisoned himself with arsenic. There is also evidence that his suicide was triggered by a turbulent homosexual affair with a member of the Russian aristocracy, but the details have been, not surprisingly, hushed up. Tchaikovsky’s legacy is truly amazing, and he is now regarded by many as Russia’s greatest composer. He is one of the very few composers who seemed capable of producing masterpieces in every major musical genre. Above all he brought about a revolution in ballet, raising it to an artistic height that it had previously not seen. The first third and fifth movements of Tchaikowsky's First Suite's were performed by the Portobello orchestra on the 16th July 2005. The conductor was Anthony Weeden.